By now you’ve probably noticed that I’m obsessed with the food scene in Chattanooga. There are so many amazing places in town to find good eats and a good time. One of the best parts of the food scene is all of the awesome Happy Hour spots in town. It’s nice to drop in for a drink after a long day at work, or to kick off a fun night on the weekend. Or just to go try something new. You know the phrase, “Why limit happy to just one hour?” These places take that to heart. Here are nine awesome Happy Hour spots in downtown Chattanooga! These are listed in no particular order. 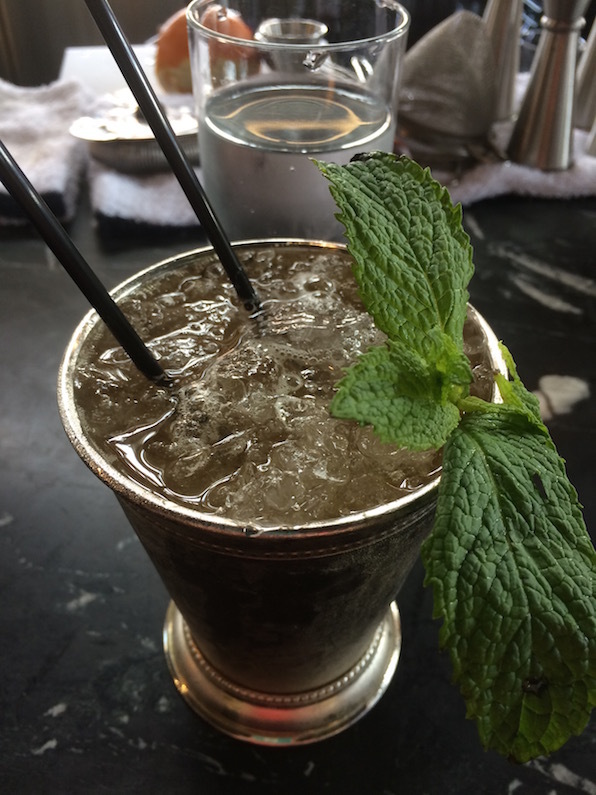 Of course there are more awesome drink spots in town–this list features mostly downtown places–but I am a repeat offender at most, if not all of these. Funny name? Sure. Great drink specials? Heck yes. Flying Squirrel offers amazing Happy Hour deals from 5-10pm every day of the week (except Mondays, they’re closed then). I’m a huge fan of half-price wine on Tuesdays, $5 select cocktails on Saturdays and mimosa carafes for Sunday brunch ($3.5 for a regular mimosa). Other nights include Whiskey Wednesdays, $3 pints on Thursdays and 25% off bottled beer on Fridays. Recently the Squirrel celebrated its 3rd birthday, and they brought back some old favorite drinks just for one night. The Watermelon Old Fashioned was so good, I had two. 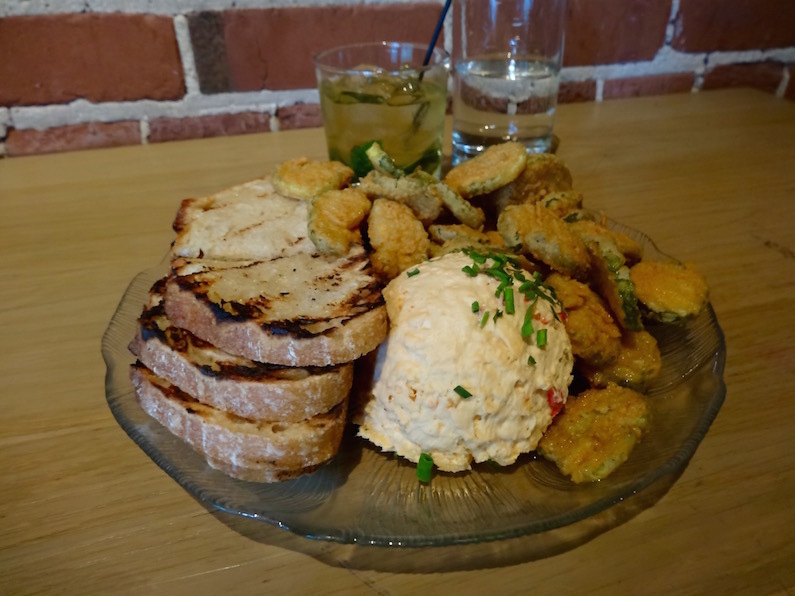 For snacks, I highly recommend the pimiento cheese plate and garlic fries. I don’t like garlic, but oh my goodness those fries are divine. This is one of the cutest places to grab a drink in town. One thing that sets STIR apart is their artisanal ice. It’s made from purified water, frozen from the inside out; this way, the ice melts slower and your drink won’t water down so fast. They even have a designated ice chef! STIR offers Happy Hour from 4:00 – 6:30, Monday through Friday. Each week they feature one craft cocktail, and that cocktail is $7 during Happy Hour. If cocktails aren’t your thing, draft beer is $4 and wine by the glass is $2 off the regular price. If you want to munch with your drink, tacos and sliders are $1.50 each and oysters are $1. Look how pretty that Mint Julep is! I love every place on this list, but I probably frequent this place more than any other spot mentioned. That’s mostly because it’s super convenient to my office, but also because the people who work there are amazing and the pizza is great. And who can say no to “mugs for pints” beer specials? Stop in Community Pie Monday through Friday from 3:00 – 6:00pm and get a mug of beer for the price of a pint. With 40 taps, there’s a brew for even the pickiest beer drinker (like me). On Saturdays, swing in for $3 sangrias ($7.50 for a carafe), grab a seat at the outside-facing bar and people-watch around Miller Plaza. There’s always something going on. Another reason I love Community Pie? Their bar also serves Milk & Honey coffee and breakfast in the mornings. I wish I had known about Frothy’s happy hour specials sooner, because it’s really hard to beat them. Frothy Monkey believes in Happy FIVE Hours, as theirs runs 2-7pm Monday through Friday. Come in for $5 cocktails and 2-for-1 select draft beers and house wines. But perhaps my favorite Frothy Monkey special is Wine Down Wednesday: 3 pours of good wine and a snack plate for $15. What beats that?! Location: 1400 Market Street, inside the Choo Choo hotel. I stopped by this spot for the first time a few weekends ago, and I couldn’t believe I hadn’t been there before. 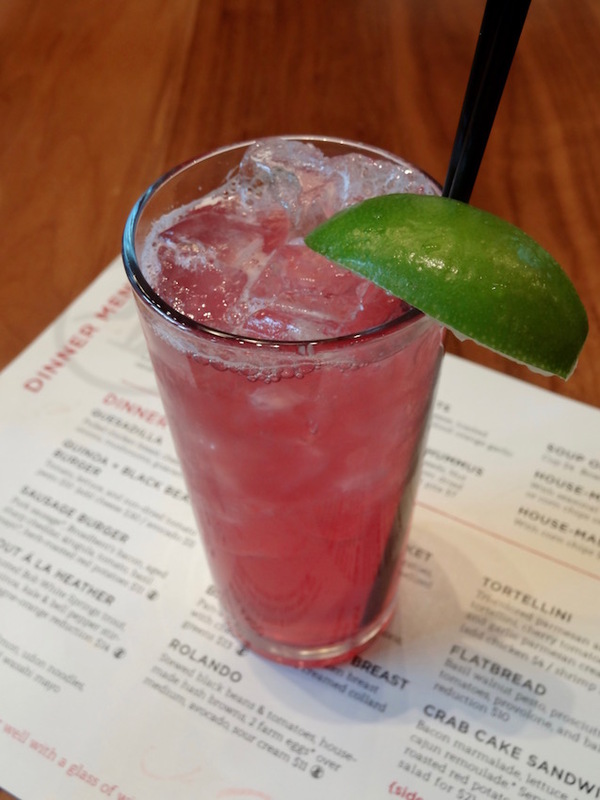 Beast + Barrel is one such spot that offers Happy Hour specials every day of the week, from 3:00 – 6:00pm. Their menu offers $3, $4, $5 and $6 selections for eating, drinking and snacking. 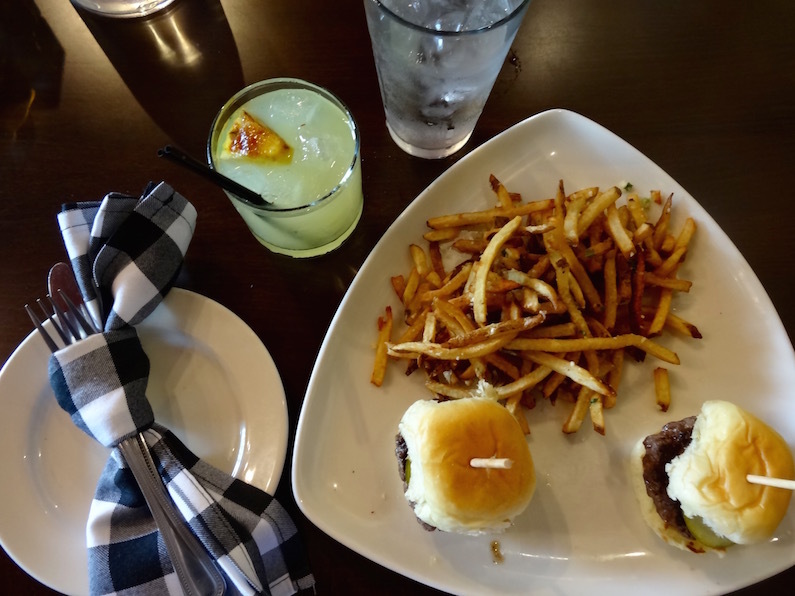 I loved the Braveheart Burger Sliders and Roasted Pineapple Caipirinha (with an actual piece of roasted pineapple garnish), and for only $12, I could love that every day. I may or may not have gone back the following weekend. While FEED Co. doesn’t have “traditional” Happy Hour specials, each day of the week has special features and great deals on drinks. Tuesdays are pint nights with $3.50 pints from a select brewery. On Wednesdays, ladies can enjoy $3 glasses of house pinot grigio and pinot noir (woo Ladies’ Night!). Come by on Thursdays for live music and a special craft cocktail, curated by FEED Co.’s talented bartenders. There’s some kind of entertainment each night, ranging from live music to trivia. P.S. It may not always be part of craft cocktail night, but I recommend the “Sloshed Housewife” drink. This was one of the first spots I checked out when I moved to Chattanooga. The Social is part of Public House, located in Warehouse Row, and is the “bar” part of the restaurant. It shares a kitchen with Public House, so the menus share many of the same items. Drink specials vary night to night, but Cocktail Hour happens Monday through Friday, with $2 off menu cocktails, $5 glasses of wine, $4 premium well drinks and more. Along with their drink specials, bar small plates are $5 each during Happy Hour (5pm to close, most days). I recommend the pimiento cheese here, too. Another spot that believes in every day Happy Hours! Praise! Swing by FIVE from 4-6pm to enjoy $5 wine, half-off well liquors, wine and beer, $5 signature cocktails and $5 snacks. Cocktails rotate week by week, but if you catch the Blackberry Rum Runner on the menu, don’t pass on it. It’s delicious. Don’t miss out on FIVE’s Ladies’ Nights on Thursdays, either: half-price select liquors and drinks, and $5 signature cocktails. Location: 200 Manufacturers Road #101 (next to One North Shore). Here, you can play some billiards, bowl a little, munch on some mac & cheese bites and sliders, and enjoy great drink specials. Happy Hours are Monday – Thursday from 4:00 until 7:00pm. It’s hard to beat $2 pints, $4 premium well liquors and $1 off craft cocktails. Come by, grab a drink and play a round of corn hole, ping pong, pool or a game of bowling. Southside Social is great for families! It’s safe to say there’s no shortage of places to wind down with a nice cocktail and tasty snacks in Chattanooga. Stop by any or all of these places and check out their Happy Hours. They’re definitely happy. What’s your favorite Happy Hour spot?